Heat the oven to 400°F. Lightly spray 2 baking sheets with vegetable cooking spray. Unflold the pastry sheet on a lightly floured surface. Roll the sheet into a 14 x 10-inch rectangle. Cut the rectangle in half lengthwise. Top 1 rectangle with the Cheddar cheese. Place the remaining rectangle over the cheese-topped rectangle. Roll gently with a rolling pin to seal. Cut the rectangle crosswise into 28 (1/2-inch) strips. Brush the strips with melted butter then sprinkle them with the Parmesan cheese and black pepper. Twist the strips and place 2 inches apart on the baking sheets, pressing down the ends. Bake the twists for 10 minutes or until they're golden brown. 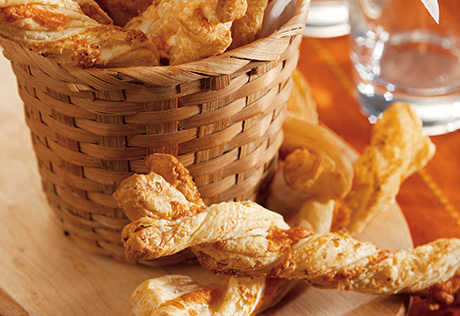 Serve the twists warm or at room temperature. Store any unused portion in an airtight container.